The Xtreme Motorcycle HID Conversion kits utilizes cutting edge HID components made with superior Japanese craftsmanship and quality. German engineered Philips capsules have been laser calibrated to ensure proper fitment and optically correct beam patterns. These bulbs provide more light on the road as well as the highest level of resistance to vibrations, extremes of temperature, and risks of explosion. Philips UV-blocking Quartz glass filters out the ultraviolet rays that are potentially damaging to modern motorcycle's plastic head lights. Lower grade HID bulbs do not use proper quartz glass to save costs and will end up damaging your motorcycle's headlamps over time and burning out prematurely. Our shockproof & waterproof slim line Xtreme ballast uses a German designed ASIC control chip which will enable the ballast to constantly monitor the HID bulb power requirements. This is the same technology that is used in OEM grade Hella & Matsushita ballasts. 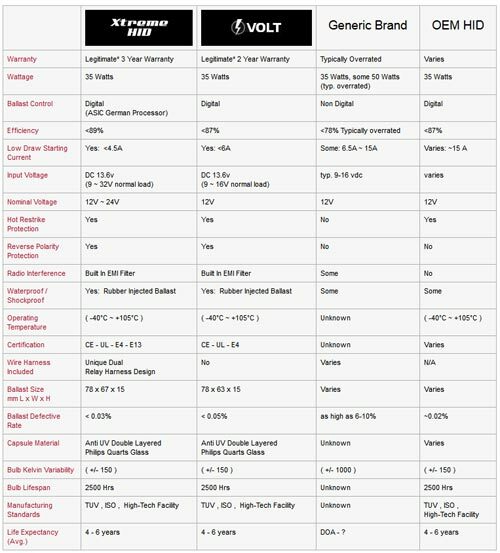 Lower grade ballasts are not able to monitor the changing bulb power requirements on a "real-time" basis meaning that there will be a significantly higher bulb and/or ballast failure rate. Our Xtreme ballast will only draw up to 4.5A on a cold start so that you can safely power the ballast directly from the OEM headlamp wiring without causing damage to your motorcycle. The ballast is uniquely designed for aftermarket motorcycle applications as it is completely epoxy sealed to protect against harsh weather conditions. In aftermarket applications, ballasts are often mounted outside the headlight leaving them susceptible to water damage especially in motorcycle application. The Xtreme motorcycle ballasts are specifically designed for this application making them the superior choice for your aftermarket motorcycle HID upgrade. Xtreme Motorcycle HID Conversion kits are manufactured in an industry leading ISO and TUV certified high tech facility. Click the button below to add the Xtreme Motorcycle HID Double Bulb Conversion Kit to your wish list.